On Father’s Day Sunday 2nd of September, Mass in the Cathedral was celebrated by Bishop Charles Drennan in te reo Māori. He extended an invitation to the parishoners of the Palmerston North Diocese to his first Miha Māori, and people gathered from as far afield as Te Wairoa. The ever angelic voices of the students, kaiako and whānau of St Joseph’s Māori Girls College, with the resounding voice of Charles Ropitini from Pakipaki (former member of the New Zealand Youth Choir), and parishoners from Dannevirke, Ohakune and Te Awa o Whanganui, filled the church. 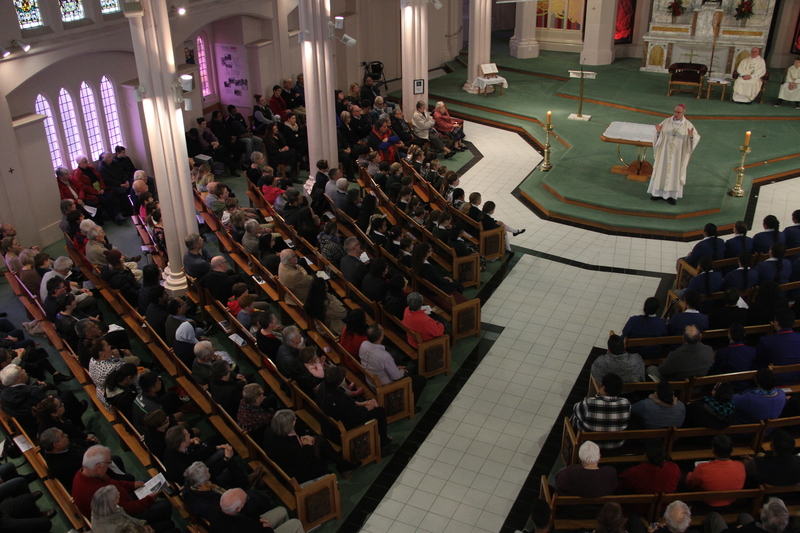 The Cathedral was packed to the brim with the Wairua Tapu permeating in and out of the pews. The local parishners being touched and wooed by what they witnessed. “Absolutely amazing,” one mum said to me. An unending stream of gratitude to the students, staff and parents of the local catholic Palmerston North schools St James, St Peter’s and Hato Paora for their preparation, attendance and particpation leading up to the Miha and on the day. Miha Māori has been conducted in various parts of the diocese for a number of years either on the marae or in the whare karakia with each parish community having their own flare. It is the hope of the Cathedral Parish of Palmerston North to work towards their Miha with the help and support of Rangitane te mana whenua and their Māori whānau.